Let’s chat about FOOD! We love it and can’t live without it (literally) but for most people/families, it is one of the biggest budget categories – usually only second to housing! I’m here to tell you that it’s also one of the easiest categories to cut! I want to share my best tips to help you save thousands on your grocery budget each year! 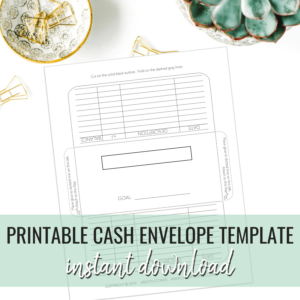 I want to show you how to get through the month and keep more of your money to pay down debt or keep in your cash envelope to roll over to the next week! Because the food budget is one of the largest it’s often the category where people overspend! The good news? It doesn’t have to be! With some careful planning and the use of a few helpful tools, you can be slashing that grocery budget in no time! WHY WORK SO HARD TO SAVE MONEY ON GROCERIES? Since beginning our financial journey, I have been focusing on stretching our food budget as far as possible and getting creative to use all the parts of our food since wasting is truly just throwing money in the trash! When you have a very tight budget every little bit counts and the grocery category has the most opportunity to save some extra dough! When I saw how effective these tips were I knew they needed to be shared so other people could benefit too! PS – If you’re on Instagram I’ve been posting lots of stories with frugal recipes and other tips over there! Sometimes you might not even realize it, but think back to the last time you spent way too much at the grocery store, I bet you hadn’t eaten! Everything on the shelf looks tempting and unfortunately, most of it ends up in your cart! Believe it or not, there have been studies done that show you will even spend more money shopping for anything when you’re hungry…not just groceries!? Eat a good meal before heading to the store and I promise you’ll notice a difference…and so will your wallet! Bring only what you want to spend and leave your debit (or credit) card at home! You literally cannot spend what you don’t have. It might be helpful to use a calculator the first few times so you don’t feel embarrassed if you’re stuck at the checkout asking to put items back…I know it sounds like a pain, but it’s honestly not a big deal, just be sure to give yourself a few extra minutes to shop! Buying in bulk can absolutely save money! I’ve price matched a ton of different items between Sam’s Club and Aldi, and believe it or not, Sam’s won each time (or tied) BUT, bulk shopping can be a slippery slope since the average item price is substantially higher (since you’re buying larger quantities) so I suggest you plan carefully when making your bulk purchases so they don’t bust your budget. For example, we just ordered a bulk order of 40 lbs. of chicken breasts from this amazing company called Zaycon Fresh and they cost us only $0.99/lb!! I’m super excited because I had heard so many people talking about how awesome they were but they didn’t deliver to my area…until now. I just about raced to the computer to sign up when I heard the news! See if Zaycon delivers to your area. Budgeting allowed us the flexibility to take advantage of this awesome price where otherwise we wouldn’t have had the money to do so! I can’t stress this enough…this is the practice that has saved us the most money, hands down! Planning out our meals ahead of time, using that plan to create a detailed grocery list and being disciplined enough to stick to that list will help you save a lot of cheddar! I know meal planning can be time-consuming and some people struggle with not having enough recipes or being able to figure out what to make. If this sounds like you, don’t be discouraged! There are awesome services such as $5 Meal Plan that offer dirt cheap done-for-you meal plans that save a ton of time! $5 Meal Plan is just as it sounds, you get a whole meal plan for dinner for only $5 for the whole month?!?! That’s barely over $1 per week…kind of a no-brainer. Plus they also give you a complete shopping list which makes it super easy to print and take to the store! You can give them a try for free for two weeks, and when you see how much time (and money) you save, you’ll be hooked! If you get the newspaper you usually will receive the circulars from your local stores. 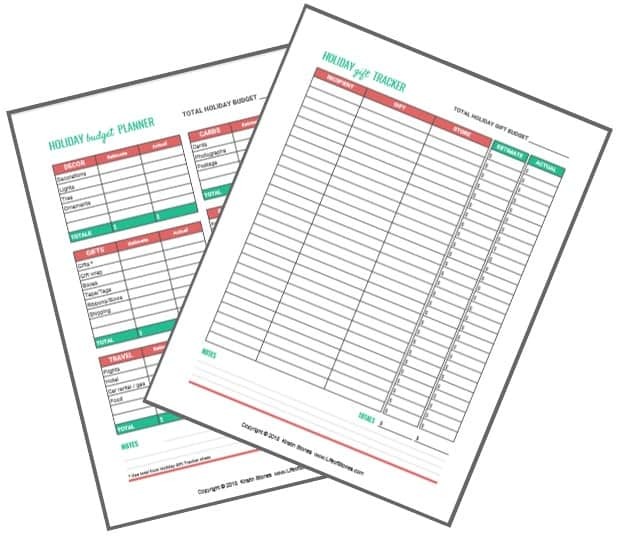 Using these to create your meal plans for the week (or even to fill a freezer stash for later) can really help you take advantage of the best prices around! To really maximize your savings would likely require you to visit more than one store, so if you have the time to make a few trips, it will likely be worth it! Admittedly, it took me a while to warm up to these…and while I don’t find a ton of items for me in these apps, they do work and they literally give you free money?!? 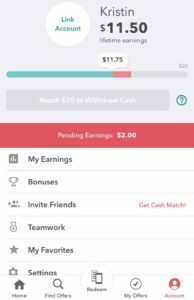 Lately, I’ve been finding a lot of big-ticket rebates lately on Ibotta and even earning some of their additional bonuses! iBotta works by offering lots of various cash rebates when you purchase a specific item. I don’t take advantage of a lot of them because most are for name brand items and I shop primarily at Aldi but there are some “no brand” offers in there and much more than just food items, so I do find some to use! The best way to use these is to search for something specific that you already need and already have budgeted. It is easy to quickly get sucked into buying things you don’t “need” just to earn the rebate! But hey, free money is free money, right? You can even get $10 free when you use my link to sign up for Ibottaand purchase your first item!!! (note: once you sign up you do have a time limit in which to make your first purchase to earn your free $10. Don’t ignore all the reminders they send you or you will miss out on your free money like I did) Here’s a screenshot of what I earned in the last two weeks! I know this may seem antiquated to many, but couponing is still a great way to save money – especially if you don’t shop at discount stores (such as Aldi) and purchase mostly brand name items! While I’m not a great resource for couponing, a quick search on Pinterest will help you find a ton of info to get you started! Warehouse clubs can be a huge money saver! You pay a yearly membership fee to join but easily earn it back in savings very quickly! But, they too, can be a slippery slope if you’re not careful because it can be tough to turn down such a great deal sometimes even if you don’t necessarily have the money! Sam’s Club is our favorite, especially because it’s very close to us and has great fuel prices too (and really good sushi)! You can get a $10 gift card when you join Sam’s Club! Another one I’ve heard people rave about is Thrive market, which is unique because it is completely online and specializes in healthy food items at much more reasonable prices! Healthy eating can really add up if you’re not careful but you can save 25% on your first order when you join! Do you have items that you purchase over and over again? If so, you can often sign up for Subscribe and Save programs at Amazon or Target! These merchants offer discounts for ordering items on “autoship” where they are shipped to you automatically on a schedule you create (and can modify any time)! We don’t currently use it for food items, but we have our cat food and litter delivered every 6 weeks from Target right to our porch and save 5% for subscribing and 5% for using our Target REDcard, which also rewards us with free shipping on each order as well! This is especially great for baby items: formula, diapers, etc. so you never run out and the programs let you edit or cancel at any time! Seriously, how cool is this? I mean if this doesn’t show you what a different world we live in these days, I don’t know what does. I know it might seem crazy to do your grocery shopping online but here’s the best part: you are able to see a running total in your “cart” the whole time you are shopping! You can immediately see if you are over budget and easily make adjustments to get back on track! It’s basically like using a calculator while you shop without having to have 3 hands to push the cart, grab your items and keep your tally! Then you pay and pick up your groceries! How easy is that?? Our local Walmarts now offer this service and I couldn’t wait to try it out!! You can check their website to see if it is in your area too! It was so easy…you shop and place your order online (there is usually a minimum order amount. Ours was $30), choose your pickup time and wait for the email telling you that your order is ready. Head to the store, pull into the designated pickup spots and an associate will bring your groceries to your car and put them in your trunk!!! HOW COOL IS THAT??!?! Give it a try today and get $10 off your first order! If this service isn’t yet available in your area then check out Amazon’s similar service for a free trial of Amazon Fresh! I’ve saved the best for last! *cue dramatic music* Shop at Aldi!!! There are some other popular ones, such as Trader Joe’s (which is about an hour from me) and LIDL (which aren’t near me, so I’ve never shopped there) and many more, I’m sure! Aldi has a bit of a “learning curve”! You have to deposit a quarter to use a shopping cart (which is returned when you return the cart) and it’s much smaller than your typical store plus you have to bag your own groceries but you can save anywhere between 30-50% on your weekly food bill (no lie)! Give it a chance, it may take a few trips to get used to and you will have to be OK with “Aldi” brands instead of national brands (which they do carry in a limited selection) but their food is really good quality and tastes great! Aldi has honestly saved us thousands over the years! Now you have all my best tips! They have served us well and I hope you find some of them helpful…I’d love to hear how they work for you! Do you have your own tips? 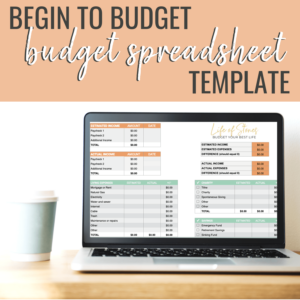 Please share in the comments so we can all save 🙂 Don’t forget to check out my new Begin to Budget Bundle to help you get started budgeting today!